I popped into one of the main Edinburgh bookstores yesterday for a bit of Christmas shopping but thought I would also check up on their cryptozoological offerings. With a particular focus on looking out for any Loch Ness Monster books, it came as no surprise that there was nothing on display. I include even sceptically minded books in that search. So while it was a relief not to see the likes of Abominable Science's poor handling of Nessie on offer, I was wondering if the lack of books on offer reflected the public's lack of interest in the subject? After all, the popularity of shows like "Finding Bigfoot" would suggest a keen interest. The most likely section for Loch Ness Monster and cryptozoological books to be found is strangely the "Spirituality" section of the book store. Ironically, the "Popular Science" section was right beside it (and I checked there in vain for cryptozoologically sceptical books). I would also point out that, being in Scotland, there is also a "Scottish Interest" section. Sadly, that had no Nessie books either. The "Spirituality" shelves seem to be a catch-all for anything kooky. Alongside the expected titles on astral projection, angels and poltergeists were UFOs and conspiracy theory titles. There were two monster-type books on sale. The first was Jospeh Nigg's "Sea Monsters" which was interesting from a sea serpent point of view but not Nessie. The one title that was Loch Ness Monster related was one previously covered here. That title was "The Loch Ness Monster: And Other Unexplained Mysteries" by J. F. Derry. Strictly this is a book about newspaper stories about Nessie and other mysteries, nevertheless, it is an interesting book. Of course, people tend to order books online these days and one will find a richer selection of books on the major retailer websites. But if the walk in bookstore is an indicator of what is most popular to the general public, then clearly good old fashioned mysteries are falling short. As a final comment, the "Popular Science" shelves were about a third bigger than the "Spirituality" shelves. In my younger days, the latter shelves would have been a lot bigger. Doubtless, an indicator of trends, even if Nessie-sceptical books can't get a look in! I wonder what readers are seeing in their bookstores? Sightings of the Loch Ness Monster are rare, seeing it on land is rarer still, but the rarest of all sightings belong to those people who dive into the depths of the loch to unexpectedly encounter its most notorious resident. I could probably count all these stories on the fingers of one hand stretching back over 130 years. So, I was delighted to stumble upon this new (yet old) story of a diver who had an unsettling time of it in Loch Ness in the 1880s. I was perusing some old newspaper clippings in the National Library of Scotland when I came across this letter from a reader in the 9th December 1933 issue of the Dundee Courier and Advertiser. Sir, As much has appeared in the press recently regarding the Loch Ness monster, perhaps it may be of interest to the readers of the “Courier and Advertiser” to hear a little more from one who for some years dwelt in the district of Dores, on the beautiful classic shores of Loch Ness. Once coming to “Meffin” I made the interesting discovery that one of the residents of this village also hailed from this part of Inverness-shire. After discussing persons and places the conversation turned round to the Loch Ness monster. “I remember,” he began, “how the villagers in that district used to talk about a monster being seen on Loch Ness, about three(?) miles from Invermoriston – that is, at Ruskich(?). The story runs that a gentleman sailing down the loch in his yacht was driven shorewards. The yacht sank and came to rest on a ledge of rock. In order to secure some of his valuables the owner of the sunken yacht hired the Caledonian Canal diver – Honeyman by name – from the village of Clachnaharry. He intimated to the assembled onlookers that he would begin work the following morning. When the coast was clear, however, the diver, thinking that he and his ??? would get something for themselves, donned his diving suit and descended into the water to make inspection. When he got to the yacht it slipped off the ledge of the rock and disappeared into the depths. But then, to the diver’s intense horror, a huge beast, measuring about nine feet long and possessing a body as stout as that of an average man, passed in front of him. Perhaps the diver thought that it was the ??? of the lower regions that had come to advise him on his dishonest work, or that Loch Ness possessed the door to the nether regions. Whatever it may have been, the diver, who in very truth had ‘got the wind up,’ adamantly refused to descend into the water again. A Lover of the Highlands. Some of the words are hard to pick out due to the letter being printed at the spine of the newspaper. The words I am not sure of are marked with a (?) while illegible ones are marked "???". However, I am sure you get the gist of the story. My guess is that this sinking occurred three miles north of Invermoriston near Alltsigh which marked the beginning of the long Ruskich Wood. Since the incident is alleged to have happened fifty years before around 1883, a contemporary half-inch to the mile survey map below marks the general area (courtesy of the National Library of Scotland). The story itself concerns a sunk yacht and a diver called Honeyman from Clachnaharry. Addressing the boat first, I have found no record of such a sinking in the newspapers of the time which some may presume to cast doubt upon the story. In fact, stories of sinkings at Loch Ness are pretty rare. The best known one was the schooner "Margaret Wilson" which struck the rocks near Point Clair back in 1861. It was carrying a large cargo of guano at the time (and wonders whether such a load attracted or repelled Nessie!). But I would suggest sinkings could as easily not be reported. The best example I can think of was the sinking of the Zulu class boat, the "Pansy", off Foyers at some time after 1911. There is no record of this 80 foot vessel sinking in Loch Ness and it was not discovered until 2002 during the Loch Ness Project's Operation Groundtruth. More details can be found here. However, more success was gained in the matter of our diver Honeyman. An examination of the 1881 census revealed a small number of males by that name residing in the Inverness county. The most likely candidate was James Honeyman who resided at No.2 Low Street in the Clachnaharry area. He was aged 31 years in 1881 which best places him as our man since the other Honeymans were aged 0, 11, 14, 61 and 66. However, his trade is stated as "carpenter" in the 1881 census and "house joiner" in the 1891 census. One may have expected the job of "diver" to be stated but on reflection I would not think so. My reason for saying so is because I do not think such a skill would be a full time job. For example, a search revealed that a Donnie Goodwin was a lock keeper on the Caledonian Canal as well as a diver. One suspects he spent more time being a lock keeper than a diver! In the same light, I suspect other divers required other jobs to gain income. 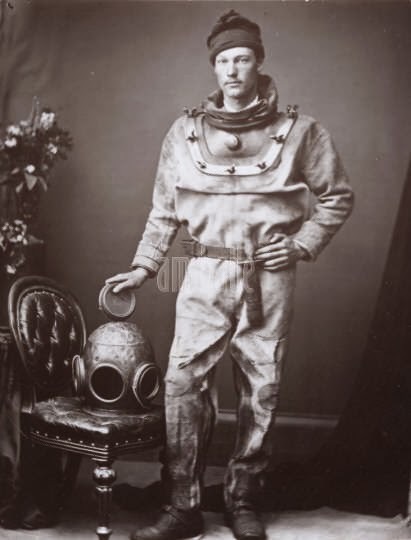 Below is an 1874 picture of a diver courtesy of the Highland Heritage website Ambaile. It cannot be verified if this is James Honeyman himself. James Honeyman's street is still there today (though doubtless it would be unrecognisable to him). It's location near the mouth of the Caledonian Canal may suggest that he was well placed for a maritime-related job. Now at this point some may ask about the well known Duncan MacDonald story from 1880. To remind readers, here is the story quoted from "The Loch Ness Story" by Nicholas Witchell. An experience by another MacDonald in 1880 was of an altogether different nature and terrifying in the extreme. As a diver, Duncan MacDonald was sent down to investigate a ship that had sunk in the Caledonian Canal entrance at Fort Augustus. Not long after, he sent urgent signals on his line to be immediately brought back to the surface. Shaking and ashen faced, he refused to say what he had seen for several days. When he had sufficiently composed himself, he told the tale of how he had seen a “very odd looking beastie ... like a huge frog” lying on the rock ledge where the wreck was lodged as he examined its hull. My first thought was whether these two stories could be the same or related in some way. But I do not think so as there is more that divides than unites them. They occurred about the same time but the names and locations are different. So a man descends into Loch Ness seeking riches but returns with terror. What exactly did he see that day? Something nine feet long and one to two feet wide swam past him but there is not much more to add. That is certainly bigger than anything known in Loch Ness but not quite full Nessie proportions. One wonders if the diver had managed to see the whole creature from the limited field of view of his helmet? Getting rough dimensions of a similar helmet, suggests the diameter of the helmet is about 24cm and the "porthole" is just over 9cm. The boat was most likely on a ledge about 10m under where I guess the horizontal visibility would be less than 6m. Drawing some field of view triangles based on these numbers gives a field of view of about 4.5m at a distance of 6m. Likewise, a 3m creature would full occupy the horizontal field of view at a distance of 4m. So, the creature would have to be less than 12 feet away to not be fully visible through the helmet visor. Of course, it could be our oft mentioned but never seen Atlantic Sturgeon which would have these proportions. Would Honeyman have recognised a sturgeon? One presumes so, but who knows in those conditions? I will just remind readers here that no sturgeon has ever been seen or caught in Loch Ness. So, an interesting story and one wonders if James Honeyman's descendants still tell this tale of their great-great-grandfather? If so, perhaps you could contact me at this blog!